This groom's wedding ceremony and reception featured a lot of elements of his Tongan cultural heritage. The Kingdom of Tonga is a Polynesian sovereign state and archipelago comprising 176 islands located between New Zealand and Hawaii. 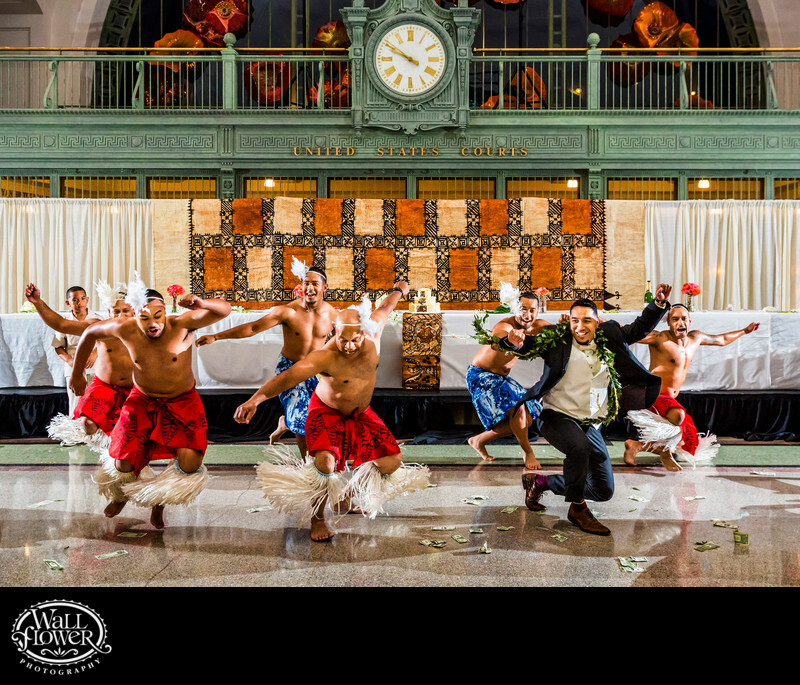 Several hours of the wedding reception, held in Tacoma's historic Union Station Rotunda, featured a variety of Tongan dances. When this men's dance, which included several of his groomsmen, got rolling, the groom suddenly jumped out of his chair and joined them! Lighting was provided by three radio-controlled Speedlites on stands, arranged in a triangle pattern around the dance floor. It really helped me freeze the action in this dimly lit room, and helps to provide shape and definition to the dancers. This photo was published in the 2015 issue of South Sound Wedding and Event magazine, which featured their wedding.